The series Linien (Lines) by German artist Florian Köhler, are site-specific, sculptural Interventions. Iron bars, that have 2 metres in length, are plastered into walls, which are repainted afterwards, so the intervention is not visible anymore. Time by time the oxidiation of the metal efforts in an rusty trace of the bar that becomes visible on the white wall. The negation of visibility and materiality leads into a negative, that results into a drawing on the wall. In a second step the artist did a series of unique books: folded paper, which shows the photographs of the lines in real-size. 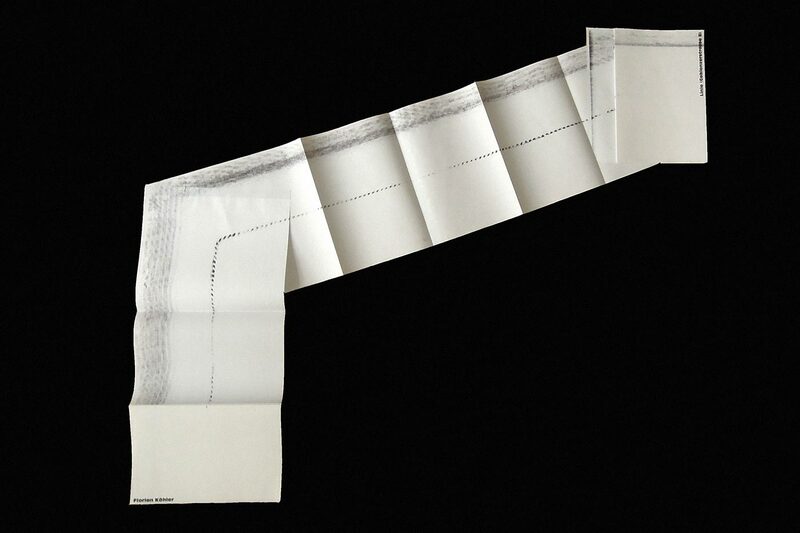 The paper used in this work is thermal paper. Under the influence of sunlight the printed text and images fade and finally disappear. What once dissappeared in a wall, appeared as a drawing on the wall - what appeared as a photograph on a paper, dissappeared again and results in an empty paper.